I have a BBB (Blogspot Blog Backlog). Been kinda sick and hectic simultaneously the past few weeks. So this happened more than a week ago I guess. It was a duel to the finish (to eat the most number of pizza slices). To add to their stories, the waiter seemed to have enjoyed serving me Hawaiian slices. I don't consider pineapple a legitimate pizza ingredient. I wanted the pepperoni servings instead. But unfortunately, we didn't have much time to stay and the promo was just about to end for that day. And so we ended up in a tie of both finishing 5 1/2 slices. Worthy opponent I must say. Too bad our rematch never transpired. I had the chance though the next week of having another shot beating my 8 slices record last year. 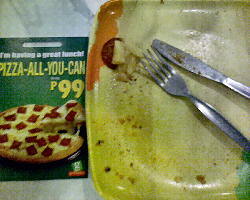 I had time to spare in between my schedule last Monday and so I decided to eat at Greenwich Robinsons Metro East. It was ideal. I had my laptop with me, the mall had free wifi and I was determined to eat all I can and more. So 2 hours after, I am proud to have broken my previous record. I now hold a new JayDJ pizza eating record of ... 10 Greenwich slices. And 8 of them were pepperoni ! The downside was I was so full the entire afternoon that I had trouble adjusting to my regular on-the-go routine. Till the next promo, one more slice please. Good thing they had pepperoni!